Here are the secrets that your physical trainer does want you to know. Abdominal breathing is not only a healthy way to lose weight restoring vitality to your body but can prevent pelvic distortions from happening. You may be wondering why people in Japan revered as being the longest lived and thinnest in the world. Is it all because of how healthy Japanese food is, or does it having to do with something you didn't even think about, breathing. In this episode of Slism, we will discuss the many benefits of breathing in your diet. Taking big deep breaths during the day a good way to deal with unavoidable irritations and worries that daily life through your way. Breathing helps promote a strong metabolism restoring the natural rhythm in your body by improving blood flow and helping your just relax. Who would have thought that just by changing the way you go about breathing you can sculpt your body. In fact, there are people out there who believe breathing is all you need to stay healthy and live a longer life. We are not going to go that far, but instead discuss how with just a little breathing you can make big leaps in your personal health. It is well known that the opening of your pelvic area can cause your internal organs to sag which then cause your midsection to stick out more than normal. What this means is that failing to correct pelvic deformation can cause the sticking out of your belly to become irreversible, leaving the frozen image of being overweight no matter how much you exercise. What do pelvic distortions have to do with breathing? On the other hand, for women who more than anything wants to avoid gaining weight in their legs, mastering breathing techniques is the solution. In particular, in this article we will focus on abdominal breathing. It turns out that abdominal breathing is an exercise that can be effective in shedding pounds of your stomach and waist. Howe this works is when your breath and concentrate effort towards your abdomen, you stimulate inner muscleslocated in your pelvic region. By just changing the way you breathe, you can train muscles in your abdomen and waist. In addition by training your inner muscles, you are less likely to put on fat and more likely to lose weight. What's the difference between abdominal breathing and normal breathing? Abdominal breathing is taking in oxygen through your nose concentrating on inflating the area in your lower-abdomen with air while exhaling from your nose or mouth. While breathing, imagine as if you are inflating your stomach with air while trying as much to not breathe expanding your rib cage as seen in normal chest breathing. By abdominal breathing you can train the muscles around your pelvic area, which in turn helps to restore you pelvis, bringing internal organs back to place. Just by doing this it is said to be also possible to get flat abs. Training your inner muscles not only makes it easier for you to lose weight, but also activates health facilities of your body and serves to increase your lung capacityin the process. As a result of your body functioning the right way, your complexion becomes clearer and your bowel movements become smoother. Breathe in the spirit of life. Without air and breathing people simply cannot go on with their lives. Who is to say that unlocking no pinnacle of your diet are not connected to this simple bodily function that most people fail to notice. In this world, people come from many walks of life and occupations. Those who spend most of their time doing deskwork often sit in the same position throughout the day working. This sort of activity hinders the blood and lymph circulation in your lower body, which is said to be connected to swelling caused by edema, having the chills, and the onsets of cellulite. 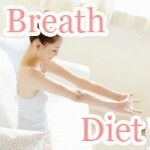 How can I turn abdominal breathing into my own weight loss secret? The breathing diet - forced abdominal breathing is geared towards women that don't want to swell up in the legs because of edema or have that swelling develop into cellulite to stick out even further. If you remember how to do abdominal breathing, there is no reason you shouldn't be able to do it at work or on the go, the easiest thing you can do to start losing weight. For those of your doing abdominal breathing at home, stretching a little while doing the exercise produces better results and can help your relax. Stretching is easy and more than adequate for the purpose of this exercise. Doing exercising that requires breathing along with stretching is also effective. For example, standing on one knee while lying down on the floor exhaling in which bringing your knee down to the floor causes oxygen to enter your body almost unconsciously. Similarly, bending over has the same effect. Learn better breathing techniques and ride your body of circulatory problems and the chills while flattening down your stomach. 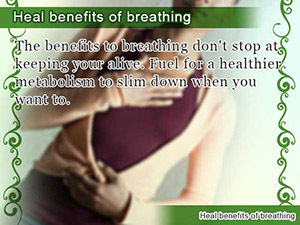 The benefits to breathing don't stop at keeping your alive. Fuel for a healthier metabolism to slim down when you want to. People around the world are doing it. 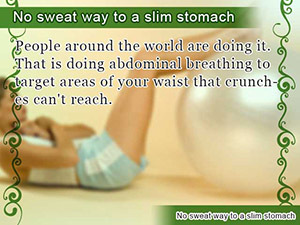 That is doing abdominal breathing to target areas of your waist that crunches can't reach. When you need to relax, don't stress it, just breathe in and exhale your frustrations. Don't forget to throw in a stretch here and there.